Approximately 47 remain from the starting field of 176 in Event #9: $580 NLH, and they are now on their one hour dinner break. Play will resume at approximately 6:20pm EST at 800/1,600 blinds with a 200 ante. Still in the field are Mike Nye, Dena Pearlman, and Randal Sklar. 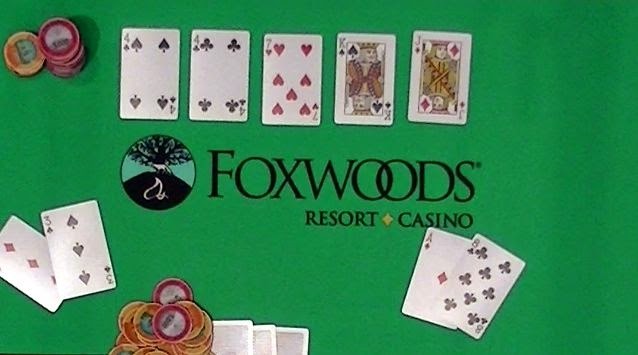 John O. Matson minraised preflop from the button and Michael Thibeau called from the big blind. The dealer put out the [9s][3d][4s] flop and Michael checked, only to see John move all in. It was a snap call for Michael as he held [9c][3c], and John would need runner runner to survive with his [Ah][Qs]. The [7c] turn meant John was drawing dead, and the meaningless [Qh] hit the river to give Michael the win. Micheal will collect $20,280 for his first place finish along with the World Series of Poker Circuit Ring. Congratulations, Michael! Kevin Gibbs was all in preflop with K-Q and was up against the [Ac][Tc] of Michael Thibeau. The board ran out [8h][4s][Td][4c][9d] and Kevin will exit the tournament in 3rd place. He will collect $9,092 for his efforts. Vincent Farrell has been eliminated when his [Qd][Qc] ran into the [Ks][Kd] of John O. Matson. 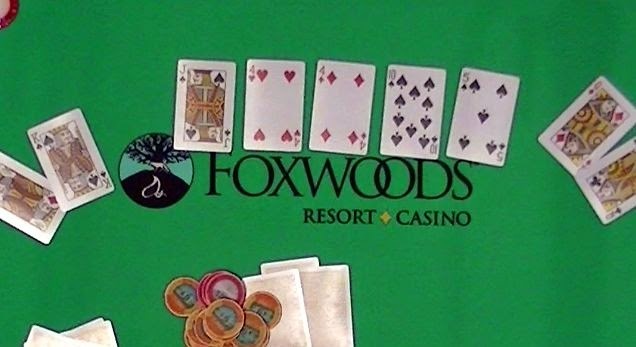 The board ran out a pure [Js][4h][4d][Ts][5s] and Vincent headed to the payout desk to collect $6,709 for his 4th place finish. James Watt moved all in with [Qc][6c] and was called with [Ah][9c]. The [8c][8d][4d] flop was no help for James, but he was still live to make a pair. The [5s] turn added a gutshot draw, but the [3c] was a brick. 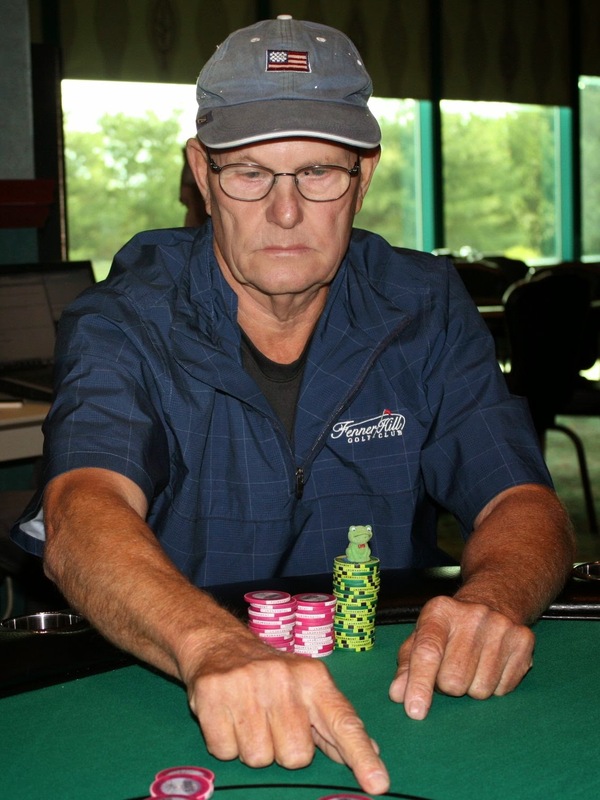 James will exit this tournament in 5th place for $5,036, adding to his win of Event #1. From the small blind, James Watt bet enough to put Michael Huguenot all in. Michael elected to call with J-6, and was dominated by James's J-T. The board ran out blanks until the river, when James paired his ten. That was enough to send Michael to the rail in 6th place, good for $3,836. 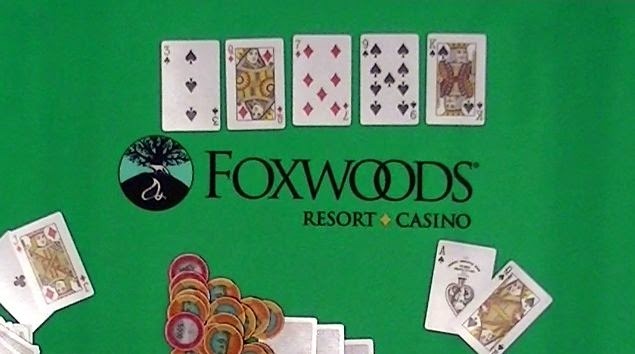 Pocket threes continue to hold up at this final table, this time to the misfortune of Aaron Frei. 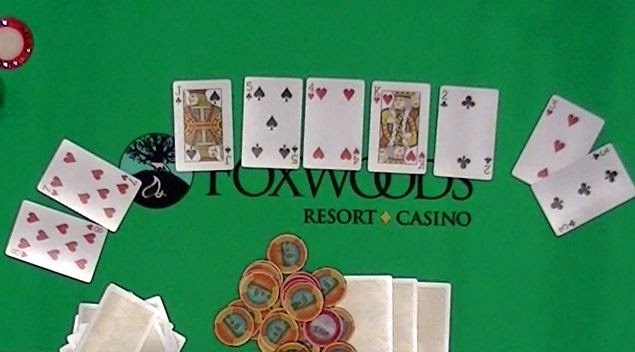 Aaron was all in with pocket fours against pocket threes, and a three on the flop spelled doom for Aaron. He could not find a four on the turn or the river, and he will be eliminated in 7th place. Aaron will collect $2,966 for his finish. Pete Huzar has been eliminated when his [Ad][8c] failed to improve against his opponent's [3s][3d]. The [4s][4c][7h][Ks][Jd] board offered no help to Pete, who will exit this tournament in 8th place. He will collect $2,332 for his efforts. It didn't take long for Mark Awalt to get all of his chips in the middle after losing a race to Vincent Farrell. Unfortunately for Mark, his [Ah][3h] was behind his opponent's [Ad][Kd], but the [4d][2c][Js] flop gave him some hope with a gutshot. The [7h] turn and [6d] river failed to improve Mark's hand, and he will exit this tournament in 9th place, good for $1,868. Vincent Farrell moved all in and showed [3h][3c]. Unfortunately Mark Awalt had not made his decision yet. It was an easy call for him with [8h][7h], but the [Js][5s][4h] kept the treys in front. The [Kh] on the turn gave him a word of outs: a flush draw to go along with his gut shot straight draw and two overs. Somehow, the [2c] hit the river. Vincent doubled up, and was immediately put on a one round penalty for exposing his cards with action pending. His 200,000 stack will be around 40,000 chips lighter when he takes his seat again. After a few chops (AK vs AK and AQ vs AQ), we finally lost our first player at this unofficial final table. Glen Stone took 10th place when his [Ac][Jd] failed to improve against his opponent's [As][Qs]. 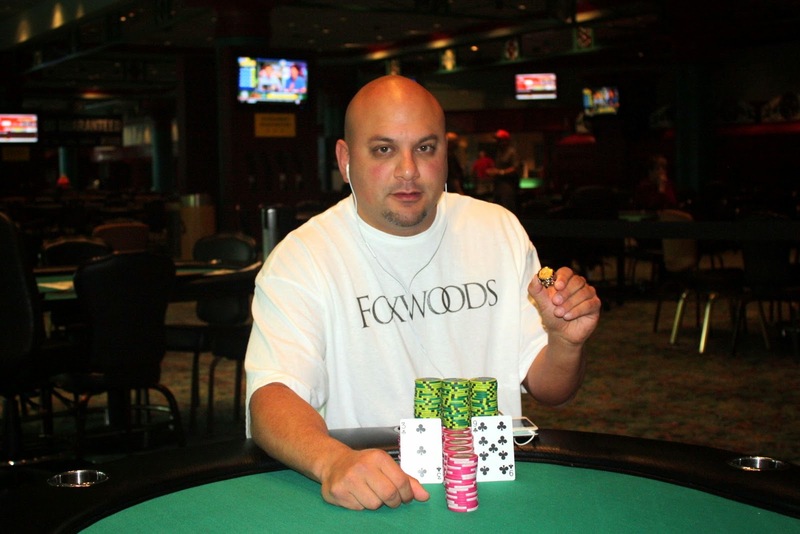 He will collect $1,504, and we are now at the official WSOP Circuit Official Final Table. Cards are in the air for Event #9: $580 NLH. 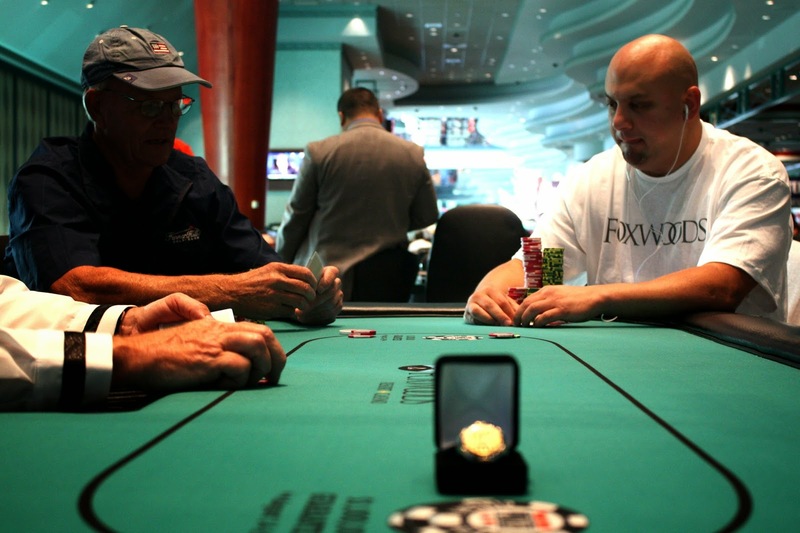 This event has six levels of registration and features 12,000 in starting chips. Full structure is available here. 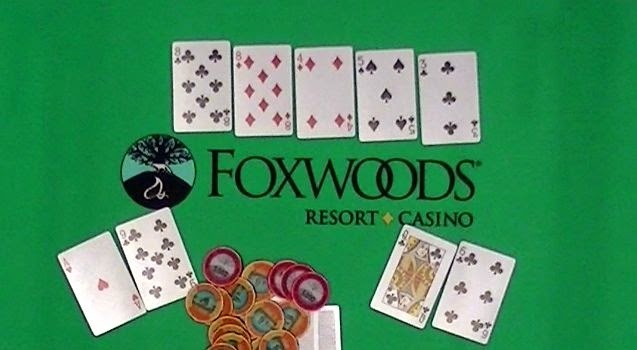 At 1pm, the final table for Event #8: $365 NLH will resume on our live stream at www.FoxwoodsLive.com.